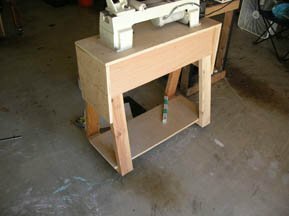 We built this lathe table to provide a portable platform for our JET mini-lathe. Our early days as a garage-based shop required mobility of all our large tools. Even in the new shop, tool maneuverability is key. Using scrap 2x4s and 3/4-inch plywood, a simple A-frame was devised from complicated plans as meticulously drawn by our graphics department. Tool height, operator height, and overall stability figured prominently in the design. Inch and half locking wheels were used on each corner. Having two fixed and two pivoting wheels sounds good, but will prove frustrating in the long run. Do yourself a favor and put four pivoting wheels on. Ten degrees turned out to be the magic number when setting the angle for our legs. Base width was decided by the length of scrap 2x4s I had lying around the garage. All was well until the novelty of wood turning wore off and we had to park the car in the garage again. We suddenly needed to get all our tools off the table and put away. Some quick measurements, a couple of drawer slides, scrap 1/2-inch plywood, and we'd be set. 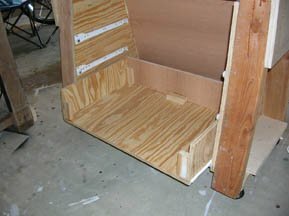 All went well until the final step where we put the fronts on and realized that the drawers didn't quite match up to the front of our stand. 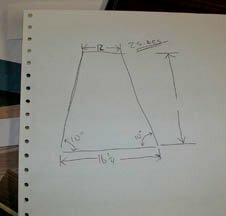 It turns out that A-frame is out of alignment (can A-frames be "square"?) by about a quarter inch on one side. I found where the error is and could not undo it without tearing the perfectly useable stand apart. 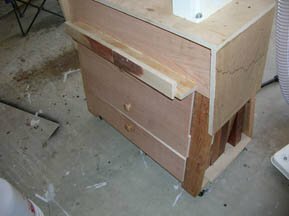 So we live with slightly unsightly drawers on our lathe table. If we were asked to build another one, no problem. But we only need one. Thus our West Hills Wood beginner woodworking philosophy was born. We can't get 10 years of experience into a few months. And since we expect to be at this game for at least that long, we must allow ourselves the slack of simultaneously being new guy and boss. We know we can do better next time, so we decided to practice by building as many shop supports as we can make use of. That's one, so far.